When I first started this blog, I had intentions of maybe blogging about my attempts at personal style, too. I mention it in my “about me” section, even. But my style is … an attempt. I’m still very casual – very much jeans and t-shirts. I’ve gotten better over the years – I no longer wear sweats out of the house (grocery store does not count; neither, I think, does the day we played hockey outside), but I’m still trying to make the attempt. You can see a bit of my style in my honeymoon posts, but I think I’d like to try to display it here, too. And I think quarterly updates would be best. We had a warm day in January, so this is what I came up with for lunch. Shorts, sweater, heels and jewelry (playing with accessories). This is from before I chopped my hair off in March. 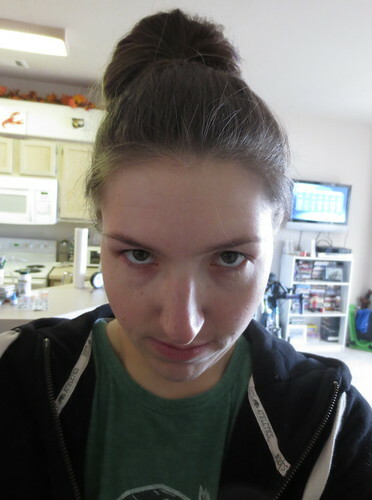 T-shirt and hoodie, yes, but I got my hair to cooperate in a poofy style that I’d seen before. No clue how I did it, but I really liked the way it turned out. 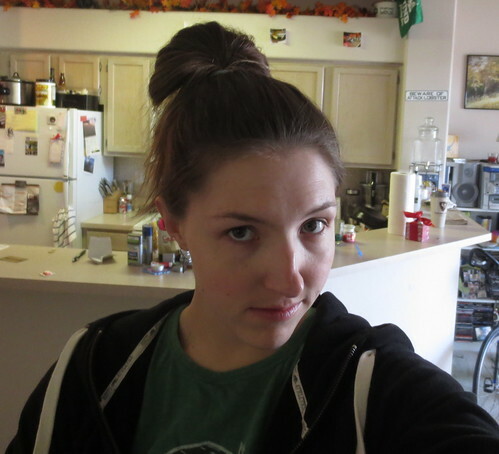 Neat twist on a ponytail … which I won’t be able to do again unless my hair gets ridiculously long again. Restaurant week outfit for Rodizio. Dress was from the Prabal Gurung for Target collection; shoes are a pair of snakeskin heels from Coach that I got for Christmas a few years ago, but never really wore – straps dug into my feet. With tights though, they fit awesome. I think this look is missing something – skinny belt, maybe? – but overall, I was happy with it.